Andrew is the Advent saint. His feast day either immediately anticipates Advent or it falls within the first week of Advent, indeed immediately after the First Sunday in Advent. In either case,this feast inaugurates the cycle of the Church’s commemoration of the Saints throughout the course of the year. There is always, it seems to me, something rich and significant about beginnings. Andrew is the patron saint of Scotland and, therefore, of New Scotland, Nova Scotia, as well, perhaps in both cases because of the connection to the sea. Yet, Scotland is a long ways from the land of the New Testament, a long ways from the setting of the story of the calling of the brothers Simon Peter and Andrew, and the brothers Zebedee, James and John, a long ways from the sea of Galilee. How much further away is Nova Scotia. This reminds us of the missionary impulse of the Christian faith. This doesn’t mean that Andrew ever laid eyes on either Scotland or New Scotland! Yet, the spiritual point is clear. Those who follow Jesus become the ones who proclaim Jesus and make him known even “unto the ends of the world.” For much of the first millennium or more, Scotland must often to have seemed to be the very end of the world. Perhaps, too, the same might be said even now of Nova Scotia. And yet, the word has gone forth on the wings of the saints and has been carried forward by their witness to Jesus Christ. Critical to that witness, as the readings on this feast day reminds us, is the Scripture. The Feast of Andrew belongs to that pageant of Word and Song which is part and parcel of the Advent of Christ. The epistle reading from St. Paul’s Letter to the Romans is a kind of mini-treatise on what we might call ‘the theology of revelation’. It focuses on the significance of the Scriptures and upon preaching. The primary form of preaching is simply the proclamation of the Scriptures. Those that follow become those that are sent and those who are sent preach the good news of our salvation in Jesus Christ. There is an important emphasis upon the hearing of the Word of God through the preaching, meaning the proclamation of God’s word. ALMIGHTY God, who didst give such grace unto thy holy Apostle Saint Andrew, that he readily obeyed the calling of thy Son Jesus Christ, and followed him without delay: Grant unto us all, that we, being called by thy holy word, may forthwith give up ourselves obediently to fulfil thy holy commandments; through the same Jesus Christ our Lord. Amen. A native of Bethsaida on the Sea of Galilee, Andrew was a fisherman, the son of the fisherman John, and the brother of the fisherman Simon Peter. He was at first, along with John the Evangelist, a disciple of John the Baptist. John the Baptist’s testimony that Jesus was the Christ led the two to follow Jesus. Andrew then took his brother Simon Peter to meet Jesus. 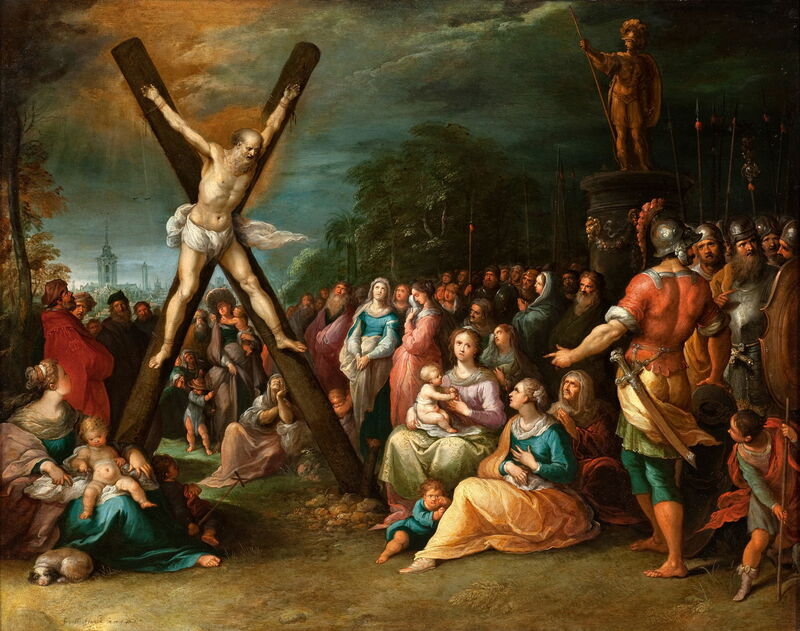 In Eastern Orthodox tradition, St. Andrew is called the Protokletos (the First Called) because he is named as the first disciple summoned by Jesus into his service. At first Andrew and Simon Peter continued to carry on their fishing trade, but the Lord later called them to stay with him all the time. He promised to make them fishers of men and, this time, they left their nets for good. The only other specific reference to Andrew in the New Testament is at St. Mark 13:3, where he is one of those asking the questions that lead our Lord into his great eschatological discourse. In the lists of the apostles that appear in the gospels, Andrew is always numbered among the first four. He is named individually three times in the Gospel of St. John. In addition to the story of his calling (John 1:35-42), he, together with Philip, presented the Gentiles to Christ (John 12:20-22), and he pointed out the boy with the loaves and fishes (John 6:8). We beheld. Yet we can only behold what we are given to see. What we are given to see is something made. It is not the Word, but “the Word made flesh”. The shepherds say “Let us now go even unto Bethlehem and see this thing which is come to pass,” literally, this saying that has happened, this Word that is made. God is the poet of Christmas. In Greek, poet means maker. But the poet not only makes, he also makes known. We can only see “this thing which is come to pass, which the Lord hath made known unto us”. We can only see in the light of God himself. Where God is, there his light is also. By the light of God we are caught up into a greater understanding. We are born anew “not of blood, nor of the will of the flesh, nor of the will of man, but of God”; born from above into the company of the one whom we behold from above. His light perfects our light. For by our own lights, we see but do not see. Our light is darkness. “He came unto his own and his own received him not.” Our seeing is without a beholding, without an embracing in faith and understanding what we are given to see. There is no receiving. But by this greater light – the light which accompanies the Word, the light of God as illuminating grace – our light is taken up into something more. We are received into what we receive. “We beheld his glory.” The greater light is the light of grace, the grace to behold what “the lord hath made known unto us”, “the Word made flesh”. The Word who wills to be made also wills to be made known. It is the great question of the Advent season, itself the great season of questions. It complements another great question, itself a biblical question, too, “what is man that thou art mindful of him, and the Son of Man that thou visitest him?” These questions recall us to God’s great question to us, to Adam in the Garden after the Fall, “Where are you?” with the implied question, ‘and what have you done?’ Somehow the questions about God and man ultimately meet in questions about Jesus. “Repent ye, for the kingdom of heaven is at hand”. This is the refrain or mantra, we might say, of the Advent season – the season of God’s coming to us. What does it mean that the kingdom of heaven is at hand? Jesus takes up this refrain from John the Baptist and makes it his own. In him it has its fullest meaning. But what is that meaning? For centuries upon centuries upon centuries, the great gospel story for this day has been the triumphal entry of Christ into the holy city of Jerusalem. He comes as a king. His coming is greeted with eager enthusiasm and joyous expectation, it seems. He is hailed as king. But is this not the gospel of Palm Sunday, the beginning of Holy Week leading to the dark pain and agony of Good Friday, the somber silence of Holy Saturday, and then, only then, the paradoxical and overwhelming joy of Easter? To be sure. But “Christmas and Easter are but the evening and the morning of one and the self-same day” as the poet and preacher John Donne puts it. There is an inescapable connection between these two primary centers of Christian contemplation. Like an ellipse, our faith oscillates between Bethlehem and Jerusalem, each are implicated in the other. Neither makes any sense without the other. We know, of course, the further irony of this triumphal entry of a king to his city. The cries of “Hosanna” quickly turn to the cries of “Crucify, Crucify!” And only so can we really begin to learn what it means for the kingdom of heaven to be at hand. “My kingdom”, Jesus will say, “is not of this world”. But that is precisely what we so often want to make it. That is precisely our darkness which the Light of Christ coming to us overcomes. 7:00pm ‘To Bethlehem with Kings’ – A concert by Capella Regalis. $ 10.00. Pulled Pork Supper & Concert (5:30-6:30, concert at 7:00) $ 15.00; (Supper only – $ 10.00). ALMIGHTY God, give us grace that we may cast away the works of darkness, and put upon us the armour of light, now in the time of this mortal life, in which thy Son Jesus Christ came to visit us in great humility; that in the last day, when he shall come again in his glorious Majesty, to judge both the quick and the dead, we may rise to the life immortal; through him who liveth and reigneth with thee and the Holy Spirit, now and ever. Amen. 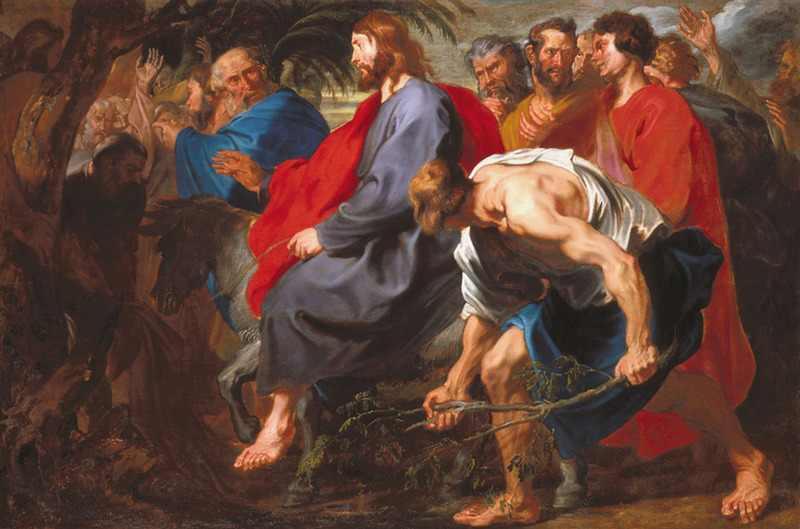 Artwork: Anthony van Dyck, Christ’s Entry into Jerusalem, 1617. Oil on canvas, Indianapolis Museum of Art. What kind of an ending is this? A strange and fearful ending, an ending that is despair? Why do anything if everything is nothing? Our lives are nothing. All our struggles, our labours, our desires and ambitions, our hopes and dreams, are they all an empty nothingness? Yes. That is the hard message of this challenging and remarkable book, The Book of Ecclesiastes. Everything that we are, everything that we do, everything that we seek, all comes to nothing, to the nothing that is vanity. “All is vanity.” This recurring refrain frames the entire book. This is actually the great wisdom of ancient Israel at the height of its philosophical understanding. But it challenges us as well. In fact, it speaks to our modernity like no other book of the Bible, for it raises the question without which the Bible and religion make little if any sense. What are we here for? This is the preacher’s constant refrain as he explores all the avenues of human existence. What is the vanity of humanity’s social, political, material and philosophical aspirations? That everything under the sun has limits and cannot explain its purpose or ours. There is a boring sameness to all things finite. Everything under the sun is nothing in and of itself and cannot explain what anything is for. Everything is nothing, it seems. O GOD Most High, the creator of all mankind, we bless thy holy Name for the virtue and grace which thou hast given unto holy women in all ages, especially thy servant Catherine; and we pray that the example of her faith and purity, and courage unto death, may inspire many souls in this generation to look unto thee, and to follow thy blessed Son Jesus Christ our Saviour; who with thee and the Holy Spirit liveth and reigneth, one God, world without end. Amen. The cult of Saint Catherine arose in the Eastern Church in the 8th or 9th century and spread to the West at the time of the Crusades. She is not mentioned in any early martyrologies. No reliable facts concerning her life or death have been established. She is now generally considered to be a mythical figure. According to her legend, St. Catherine lived in Alexandria when Emperor Maxentius was persecuting the church. A noble and learned young Christian, Catherine prevailed in a public debate with philosophers who tried to convince her of the errors of Christianity. Maxentius had her scourged, imprisoned and condemned her to death. She was tied to a wheel embedded with razors, but this attempt to torture her to death failed when the machine (later a Catherine wheel) broke and onlookers were injured by flying fragments. Finally, she was beheaded. St. Catherine is often portrayed holding a book, symbolic of her great learning. She is the patron saint of teachers and students. Artwork: Gaspar de Crayer, Triumph of St. Catherine, 17th century. 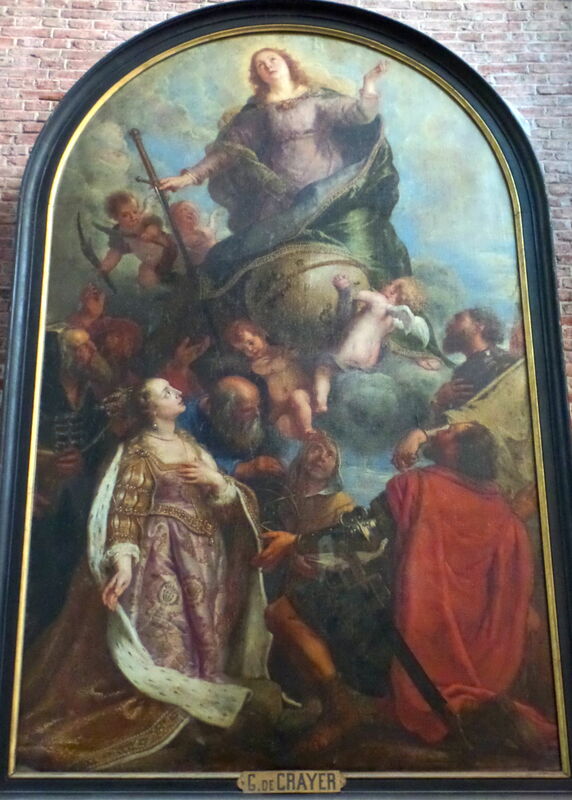 Oil on canvas, Chapel of St. Catherine of Alexandria, St. Michael’s Church, Ghent. Photograph taken by admin, 11 October 2014. Saint Clement was one of the first leaders of the church in the period immediately after the apostles. Some commentators believe that he is the Clement mentioned in Philippians 4:3. If so, he was a companion and fellow-worker of Paul. The Roman Catholic Church regards him as the fourth pope. 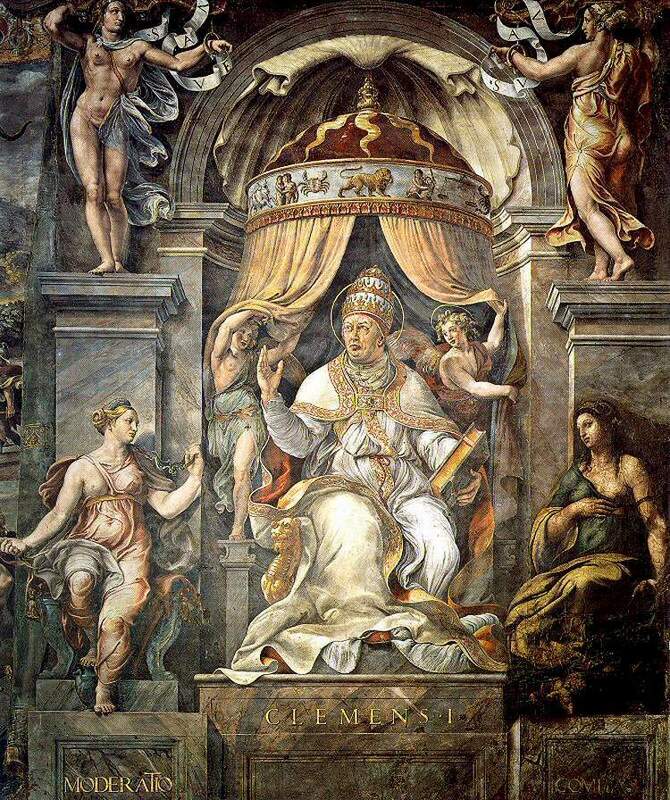 St Clement is best known for his Epistle to the Corinthians, dated to about 95. Clement addressed some of the same issues that Paul had addressed in his first letter to the Corinthians. The church at Corinth apparently still had problems with internal dissension and challenges to those in authority. Clement reminds them of the importance of Christian unity and love, and that church leaders serve for the good of the whole body. Although the letter was written in the name of the Church at Rome to the Church at Corinth, St. Clement’s authorship is attested by early church writers. This epistle was held in very high regard in the early church; some even placed it on a par with the canonical writings of the New Testament. Artwork: Giulio Romano (design by Raphael), Clement I (detail from The Vision of the Cross), 1520-23. Fresco, Hall of Constantine, Raphael Rooms, Vatican. What is the Bible? It is a book, to be sure, even The Book, though it was not always a book exactly. Formerly, there were scrolls of parchment as the Bible itself shows us. Jesus, for example, takes up the scroll of Isaiah and reads from it and proclaims the fulfillment of what he reads. But, at any rate, it has become a book, that is to say something enclosed between two covers. It is, moreover, a library of books, a book containing within itself a great number of books, a wide variety of literature, things written at different times and in different places. Is it just a collection of literary artifacts from times and places long ago and far away? And if so, why read it now? Because it speaks not only to particular cultures but beyond them. Something of the answer to the question ‘what is the Bible?’ is captured in this characteristic. What we call ‘the Bible’ bears witness to this phenomenon of speaking beyond the particular context and circumstance for which or about which a particular text was originally written. It also bears witness to the writing down in one context of what is remembered from another context. For example, the people of Israel wrote down and put together while in exile in Babylon what was remembered of God’s Word to them at the time of the Exodus from Egypt. Somehow what is remembered and written down is received as being altogether definitive, as defining the fundamental identity of Israel in quite different political and cultural circumstances. Somehow what is written down cannot be constrained to just one context. It reaches beyond. The point is captured best, perhaps, by St. Paul’s marvelous summary phrase: “Whatsoever things were written aforetime were written for our learning.” The Bible in all its varied literary array, is inescapably what is written. Hence, it is ‘Scripture’ – what is written. And yet what is written is simply what is remembered as Revelation. The Bible is the witness of God’s Revelation.